At the Sainsbury Wing of the National Gallery is my most anticipated exhibition of the year: “Vermeer and Music: The Art of Love and Leisure”. Based mostly on artworks in its own collection, we are given a glimpse into the 17th century Dutch paintings and the association tied to the period’s popular theme, music. Alongside it are displayed musical instruments and songbooks of the time, such as harpsichord and violin, as if they have popped out of the paintings themselves. Room One, ‘Music as Attribute and Allegory’ is mostly of still lifes where music stands as a symbol for transience of life. It also indicates an intellectual status of the sitter of the portrait, someone of a good taste and education. In Room Two, ‘Musical Companies and Festive Gatherings’, we see how music was an integral part of Dutch society, with everyone participating in making music in their everyday lives. Music is what brings harmony. As beautifully captured by Jan Steen’s “A Young Woman Playing a Harpsichord to a Young Man”, Room Three, ‘Intimate Duet’ is all about subtle sensuality music brought and the relationship between characters behind the ‘innocent’ playing of the instruments. 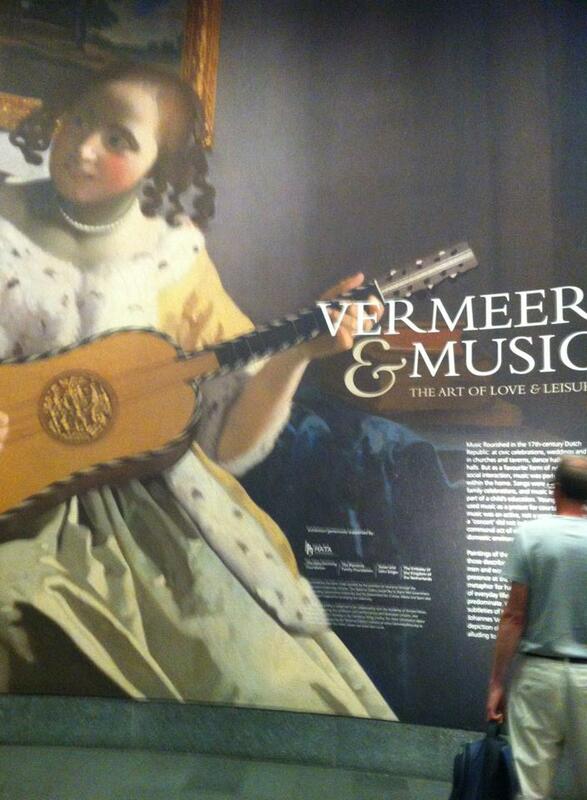 The highlight is, of course, is the final room ‘Vermeer and Solo Musicians’. It is a little disheartening that there are only five paintings of Johannes Vermeer out of 35 artworks in the exhibition, but nonetheless, having ‘The Guitar Player’, ‘A Young Woman standing at a Virginal’, and ‘A Young Woman Seated at a Virginal’ displayed on the same wall is just simply paralysingly beautiful. ‘The Guitar Player’ is the most captivating of all – the sense of tranquillity is highlighted by the empty wall on left side of the sitter which takes up almost half of the entire canvas, as if to intensify the sound of the chord which has been just strung on the guitar. The exhibition ends with a closer look at Vermeer’s techniques, delving into his brush strokes, use of colours and paint thickness. You can also see magnified photographs of fingerprints found in some of his paintings. Live music is played by the members of the Academy of Ancient Music at dedicated times, which is a treat to have at the background while looking, but perhaps not worth queuing for 20 minutes for a seated performance. Overall, it is a pleasant exhibition that includes artworks by Jan Steen, Peiter de Hooch and Gerardter Broch. Having to pay £7 to see what is mostly already part of the National Gallery’s collection felt like a bit of a rip off, but the five breathtaking paintings by Johannes Vermeer made me content enough. The exhibition runs until 8 September 2013. I absolutely love the bit about finding finger prints in the painting! Bits of brush hair and fluff have also been found stuck on the surface of paints, indicating that Vermeer was using a low quality brush! They are so small that neither of them are visible to the naked eye.